There’s no denying nature’s inspiration, especially this time of year. In fact, Mother Nature has been the muse for quite a number of lighting designs, from beautiful blooms to bright bursts of color. Here are 10 fresh, flowery fixtures we love, just in time for spring. 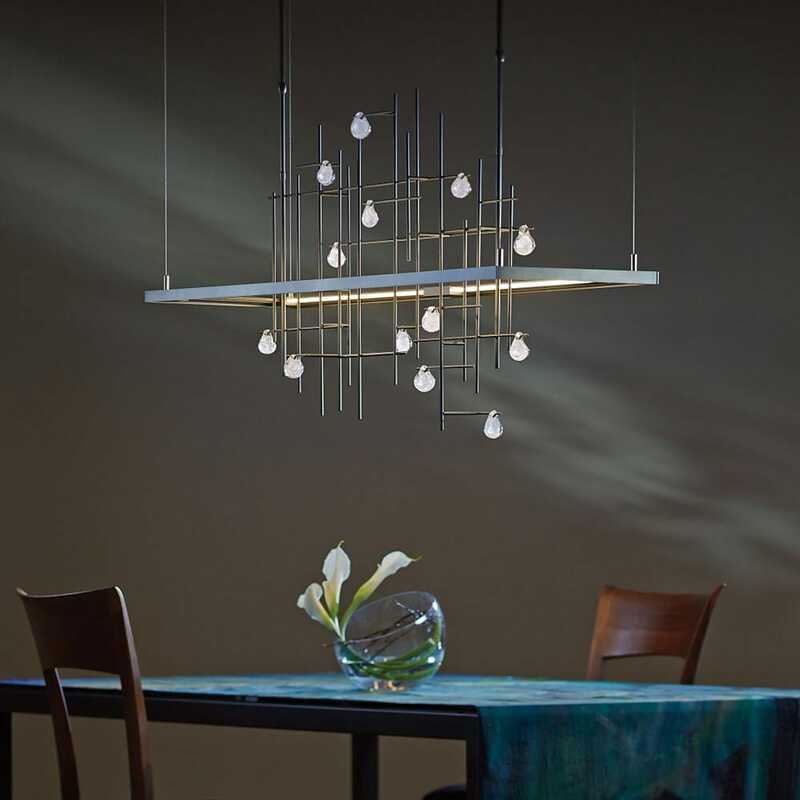 Vermont-based Hubbardton Forge recently introduced Vermont Modern, an energetic new collection with the brand’s signature high-quality, hand-crafted philosophy. 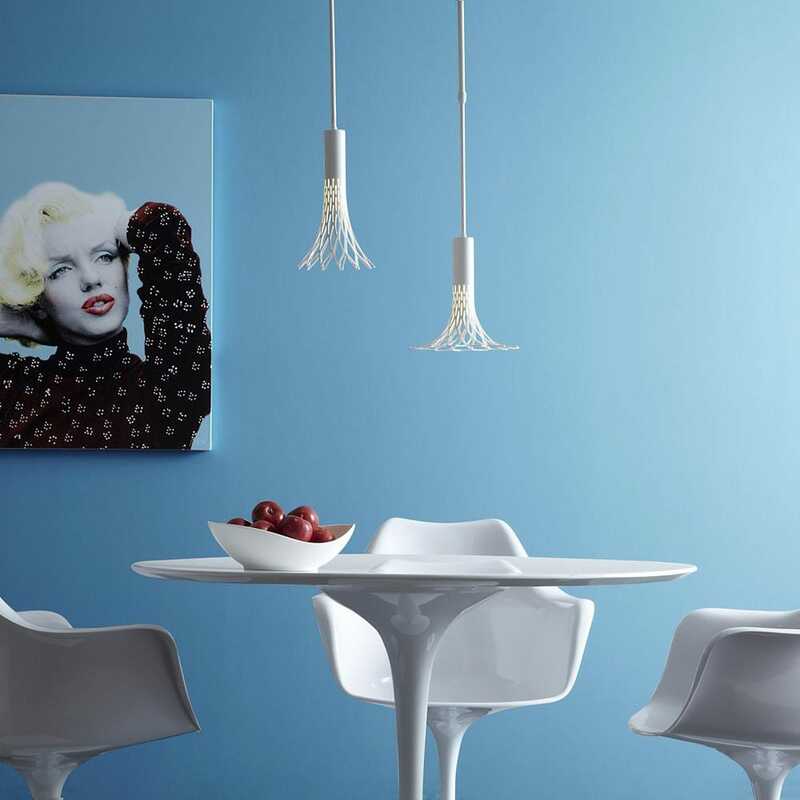 The Full Bloom Mini Pendant is made of a single steel tube that’s been laser cut, heated and expanded into the final fluted shape reminiscent of, well, a flower in bloom. Each is made by hand and available in an array of colors, ideal for arranging over a dining area or kitchen island. The Muse is nothing short of a modern marvel. Elasticized fabric stretches smoothly over a wire frame to create a rounded disc of overlapping gentle floral outlines. 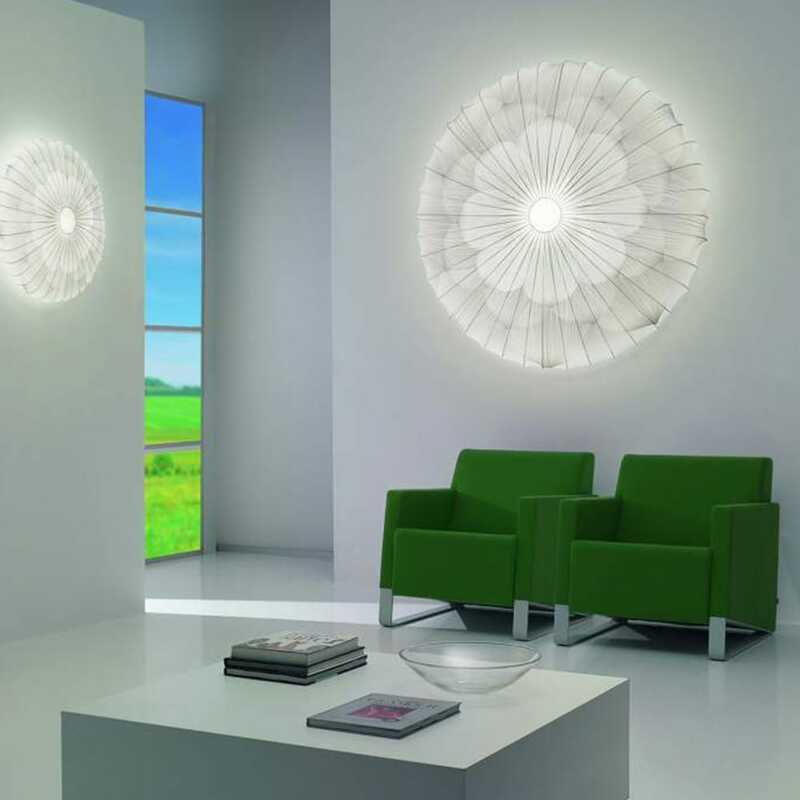 The design works on the wall or the ceiling, making a lovely artistic statement no matter where you hang it. Bonus points for the removable, machine washable fabric. 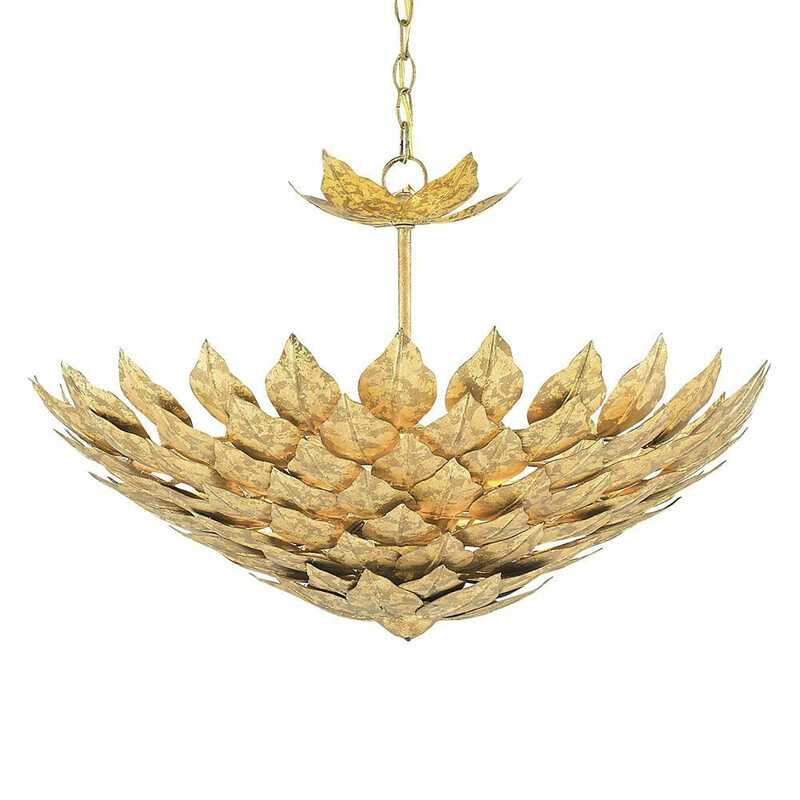 The Floral Pendant from David Trubridge makes a globular statement out of natural bamboo. It’s eco-friendly flat shipping means you get to build the fixture yourself. The easily interlocking components form a blooming flower pattern once complete, with light peeking out from between the cut out petals. The result is beautiful cast shadows and light play on the surrounding ceiling and wall. 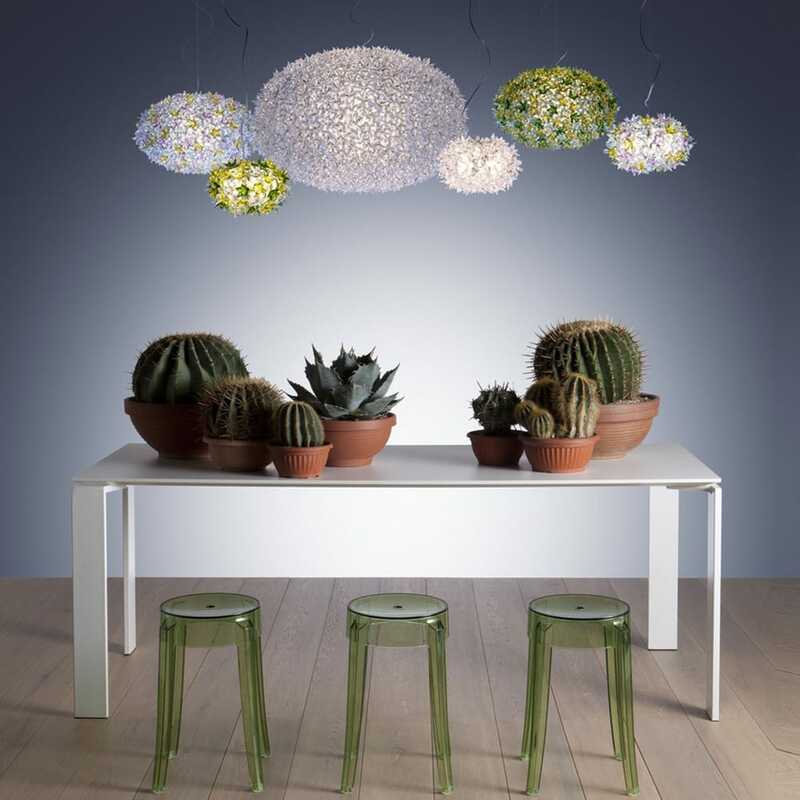 Made in Italy by Kartell, the Bloom Pendant takes floral arranging to a new and thoroughly modern level. The intricate flower details are made of a sparkly, transparent techno-polymer in color schemes that include mint green, lavender and clear crystal. It’s lovely on its own or grouped together in ever-blooming clusters. Talk about flower power. 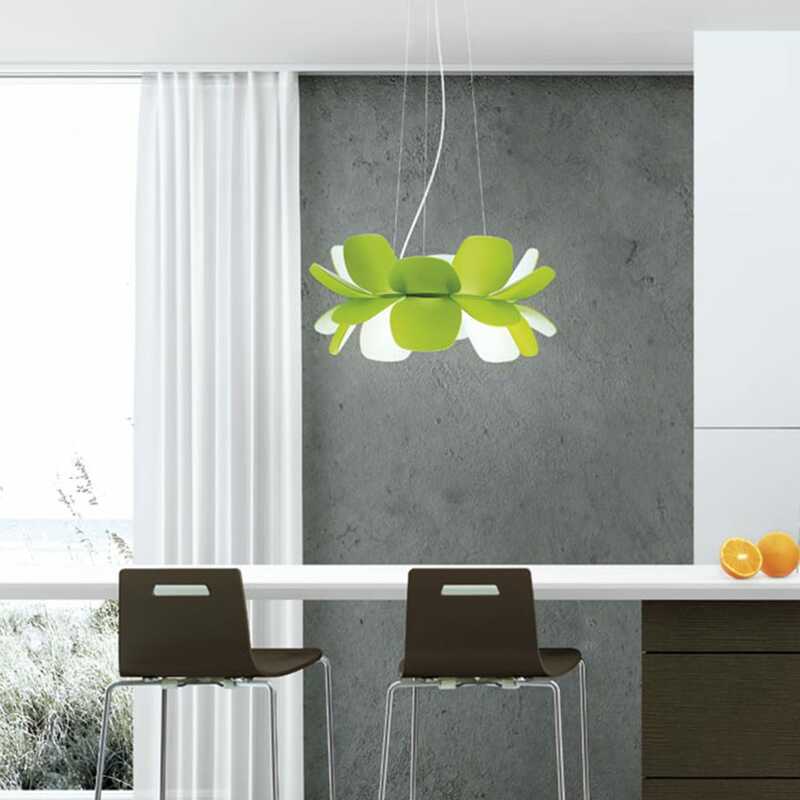 The Infiore (the Italian word for flower) Pendant makes a bold statement with color-injected polycarbonate petals that bloom up, down and all around. The result is soft, diffused light in full floral form. 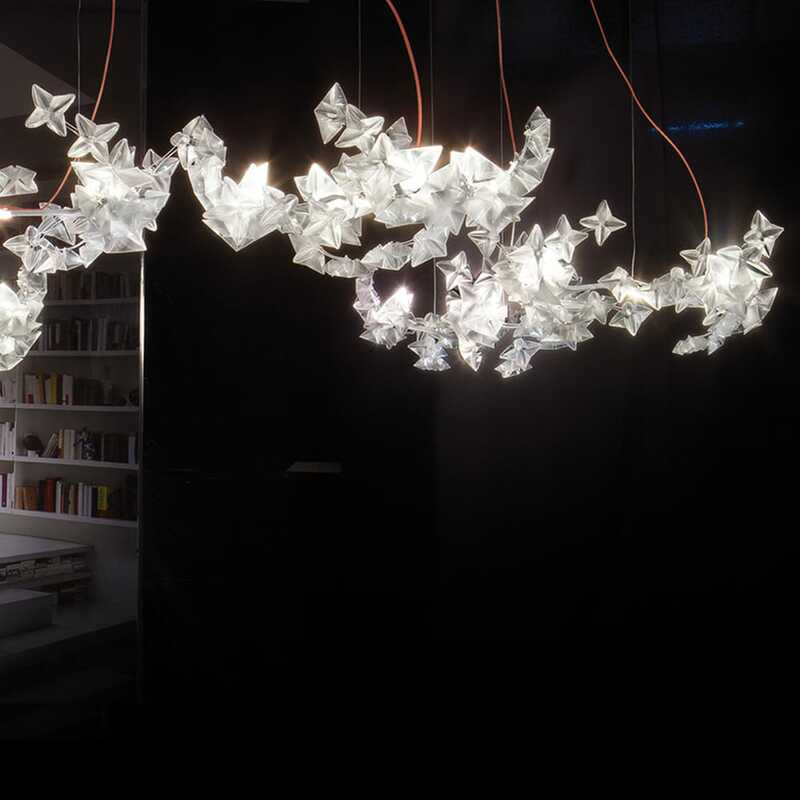 Flowering cherry blossoms comprise the Hanami Suspension by Slamp. 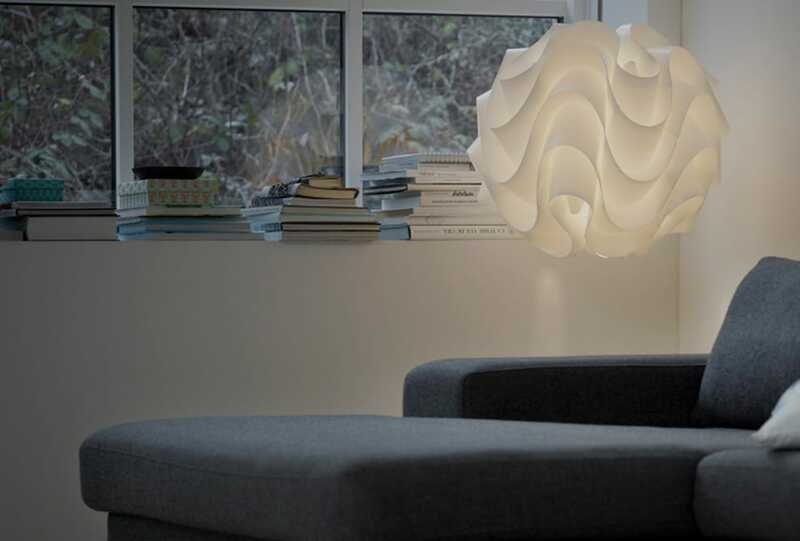 The fixture is inspired by the Japanese tradition of admiring the transitional beauty of flowers, with hand folded, translucent Lentiflex flowers. LED light sourcing ensures this light is efficient, beautiful and most definitely worth the lingering of your gaze, no matter the season. Inspired by raindrops cascading down a garden trellis, the Spring LED Linear Suspension is an elegant interpretation of a modern botanical concept. Every part of this dramatic piece is made by hand, from the forged metal to the mouth-blown glass. The design is part of the Four Seasons collection, which reinterprets seasonal moments into sophisticated lighting fixtures. Comprised of dozens of multi-toned golden leaves inspired by the Oleander flower, this botanical beauty is handmade in the Philippines and—just like its flower namesake—stands the test of time with its classic look. 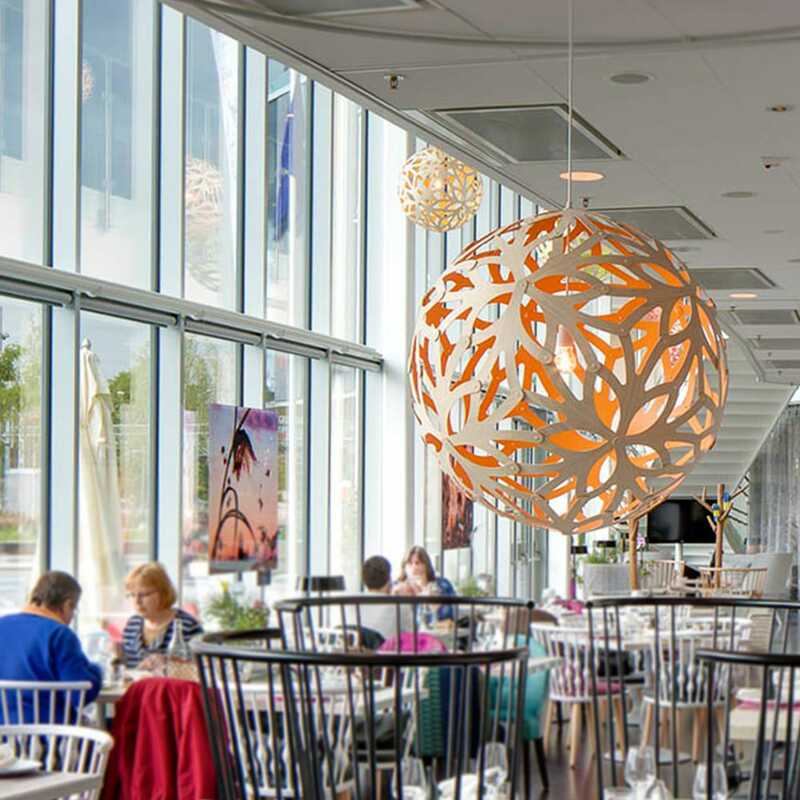 It also has a functional versatility, able to easily transition from chandelier to a semi-flushmount. 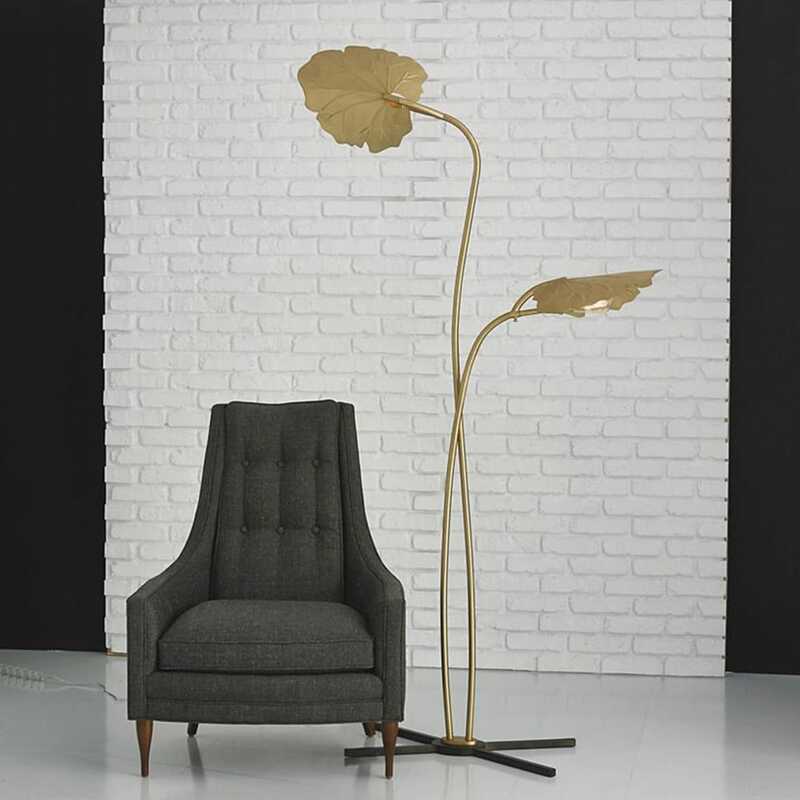 The Rimini Floor Lamp is one chic way to bring a bit of a jungle vibe to your space. The sweeping gold leaf canopies rotate to direct the light exactly where you want it. You might be tempted to tuck it into a cozy reading corner, but this piece could easily become the focal point in a room.